I'm not exactly sure what I was doing throughout the 1980s, but I do remember rockin' some Jams (ridiculous shorts that apparently you can still buy online) while balancing my dad's love of the Beach Boys with my sister's new fondness for some guy named Jon Bon Jovi (I also remember my dad claiming that Bon Jovi wouldn't even make it into the 90s). I also remember sitting down to enjoy many different sporting events with both of my parents and listening while they shared story after story about the greats of a particular sport. I believe, as do many others, that it is incredibly important to respect those that have blazed a trail previously to truly understand where we are today. I've recently heard numerous authors speak about the impact that Cynthia Rylant has had on either their careers or their children. 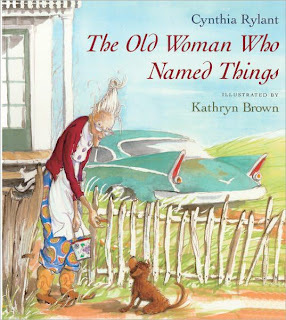 After continuing to hear Ms. Rylant's name, I realized that it was time that I respect the history within Children's Literature and study her work. I returned from the public library yesterday with many of her books in my arms. After working my way through them today, a common theme arose: beautifully chosen words within a simple, yet elegant story. While I enjoyed each of her books that I read today, one particular story stood out in my mind. I recently heard an author speak and she mentioned that she always like to include "old people" people in her stories. She said this in the most respectful of ways, appreciating the stories that older generations had to tell and often the lovable quirks that may accompany these individuals. I was reminded of this as I enjoyed The Old Woman Who Named Things. I was also reminded of the stories my dad would share with me about the beauty of the '57 Chevy; my best guess as to what Ms. Rylant used in this text and affectionately named Betsy. Often, it is difficult for older generations to make changes to their lifestyle, but I was happy to see that "the old woman" in this story had enough room left in her heart.